Everyone has been talking about the Higgs boson this past week due to CERN’s sort-of discovery announcement. People keep asking me what this is all about. So here is my take on the Higgs boson story. Actually, I will try to recount why we need the idea behind the Higgs boson to describe nature. And I will try to do that in a way that doesn’t just appeal to the usual carricature descriptions but gives you the real idea. Amazingly, the real story is not that difficult. The story is not that difficult, because there is a more down-to-earth example where the same physical idea applies. This is the propagation of radio waves through a plasma. In the beginning of the 20th century wireless communication by radio waves was introduced, with the first trans-atlantic radio signal sent by Marconi in 1901 between Cornwall in England and Newfoundland on the North American side. Since the earth is curved, there is no direct line-of-sight connection between places that far apart, so one may wonder how the radio waves can go from here to there. However, it was realized in those times that radio waves can bounce off a layer high up in the atmosphere. This layer is called the ionosphere, and it extends up from 85 km to about 600 km. In the ionosphere, energetic ultraviolet radiation from the sun constantly knocks out electrons from the atoms and molecules. As the negatively charged electron escapes, it leaves behind a positively charged atom or molecule, called an ion. The ionosphere thus consists of many negatively and positively charged particles (negative electrons and positive ions), besides some remaining neutral particles. A gas of charged particles is called a plasma. Now a plasma has a very important effect on the propagation of electromagnetic waves, as the radio enthusiasts found out early in the 20th century. Here is what happens in a plasma, and this will be the mechanism that is at the heart of the ideas behind the Higgs. When an electromagnetic wave (such as a radio wave) enters a plasma, its oscillating electric field sets into motion the electrons and ions. Each of those charged particles is accelerated by the electric field inside the wave and starts to oscillate as well. Any oscillating charged particle also creates an electromagnetic wave. This new wave adds to the original wave. In other words, the electromagnetic wave traveling inside the plasma now has become a new combination of oscillating electric and magnetic fields and oscillating charges. Not surprisingly, this wave has new properties, different from its properties in free space, outside the plasma. The most important property of any wave is the relation between wavelength and frequency. From this, many important features such as the speed of the wave can be deduced. All the different types of waves (e.g. sound or water waves, electromagnetic waves or matter waves) have their own distinctive relation between wavelength and frequency. Now for the waves in a plasma, this relation can be calculated, and it looks like this. This graph is the most important part of the story, so we will have a close look. The graph shows the frequency (oscillations per second, measured in Hertz) as a function of the wavelength, for electromagnetic waves inside a plasma (that is the red curve). Actually, we have chosen to plot the frequency against the inverse of the wavelength, so long waves are to the left (large values of the wavelength “lambda”, small values of 1/lambda), and short waves are to the right. This is the way physicists like to plot these relations, and in particular the high-energy physicists dealing with the Higgs and other particles would always do it like shown here. Now there is obviously an important difference between the waves in free space (dotted line) and the waves inside the plasma (red curve). At long wavelengths, the waves in free space have low frequencies. In fact, for those free-space waves the frequency goes to zero as the wavelength becomes larger and larger, according to the relation “frequency = (speed of the waves)/wavelength”. In contrast, the waves inside the plasma always have a minimum frequency, even when their wavelength becomes very large. This frequency is called the “plasma frequency”. That is the most important difference between electromagnetic waves inside the plasma and those in free space. The plasma frequency depends on how many charged particles there are in the plasma. If the density of those charged particles is reduced, the plasma frequency will also shrink. In fact, this happens in the ionosphere, because the amount of ultraviolet radiation from the sun fluctuates, and so does the density of the free electrons and ions that are created by this radiation. You might ask: What happens if a radio wave has a frequency below the plasma frequency? 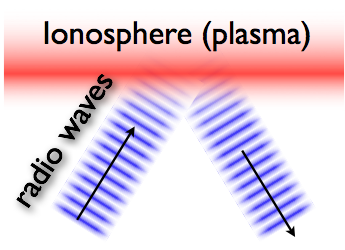 What will happen when this radio wave impinges onto the ionosphere’s plasma? The answer is simple: It is completely reflected! This is the phenomenon that the radio operators use to bounce off waves from the ionosphere. Actually, when the wave does not hit the ionosphere layer directly but at an angle, it can be totally reflected even when its frequency is higher than the plasma frequency. For the ionosphere, the plasma frequency is around 10 million oscillations per second, i.e. 10 Mega-Hertz. Now we come back to the Higgs mechanism. In the 60s, it was realized that there was a huge problem in the fundamental theory of particle physics (what has now developed into the so-called “Standard Model”). The mathematics at that stage seemed to say that in addition to the electromagnetic (and the gravitational) interactions, there should be other long-range forces. Of course, no one had observed those forces, so it was clear that there was something missing in the mathematics. In fact, people knew quite precisely what was missing. In order to describe the weak forces (responsible for beta decay and other processes), the theorists had been required to introduced new wave fields. However, initially it seemed these fields were just like electromagnetic waves in free space, and would correspondingly give rise to long-range forces similar to the Coulomb force. Unfortunately, this completely contradicted experimental data, which showed that these forces were all short-range. More precisely, the known experimental facts implied that the relation between frequency and wavelength for these new wave fields should not look like that for free electromagnetic waves. Rather, it should look exactly like the graph for the waves inside the plasma, shown above! Initially, it was not at all clear how this could be brought about without breaking other important mathematical features of the theory. The theorists were stuck with the mathematics and did not yet think of useful physical analogies (like the plasma). However, in 1963 Phil Anderson, a solid-state physicist, pointed out that there is an example where exactly the right thing happens. His example were superconductors, i.e. metals at low temperatures that conduct electricity without resistance. There, the electrons can be freely accelerated like in a plasma, and electromagnetic waves are influenced in exactly the way that would be required. I have chosen to tell the story in terms of a plasma, because it is nearer to everyday applications than a superconductor (at least for radio communications), but on the most elementary level needed here, it is really the same physics and the same mathematics. Anderson’s suggestion (following an earlier hint by Schwinger) was still not a relativistic field theory, as required by particle physicists. That last, important step, of building a working relativistic model, was then taken the following year in three independent scientific articles. One was by Brout and Englert, the other by Peter Higgs, and the third by Gurelnik, Kibble, and Hagen. These publications showed that if one introduced a suitable new field, which is analogous to the plasma (or the superconductor), and couples this new field to the wave fields of the weak force, then everything works out fine. The wave fields change their properties, exactly identical to the change of properties we observed for the electromagnetic waves when they enter a plasma. And as a consequence, the wave fields no longer produce long-range forces but acquire exactly the right properties that are also observed in nature. So this is the story of the “Higgs mechanism”. In his 1964 article, Peter Higgs then additionally pointed out that, as a sort of side-product, the new field which is required for this mechanism shows some high-frequency oscillations. These high-frequency oscillations could be excited in suitable experiments, and in the language of particle physics they correspond to a new particle, now commonly called the “Higgs boson”. So that was the story behind the Higgs boson, in terms of waves. Basically, we are finished here, and I hope you enjoyed the explanation. For those who want to learn even more, let me complete the story by pointing out what all of this has to do with mass. Here Planck’s constant is a fixed number, one of the fundamental constants of nature. For example, this means that electromagnetic waves of a certain frequency can only contain energy that is a multiple of this value. As it were, energy comes in small packets, of the size given by the formula. In the case of the electromagnetic field, these energy packets are called photons, and there are analogous names for other wave fields. This means that any particle of a given mass contains a (huge) amount of energy. However, we can also read this the other way around. If we have a packet of energy, it corresponds to a certain amount of mass. Now, when we combine these equations, it becomes plausible that waves of a given minimum frequency also have a certain minimum energy, and this can be identified as a mass. In this sense, people would say that waves with a minimum frequency like the electromagnetic waves in a plasma correspond to particles of a certain mass. We have now collected everything that is needed to understand why the Higgs mechanism has to do something with “mass”. A high-energy physicist would say that electromagnetic waves propagating in a plasma have “acquired mass” via their interaction with the plasma. By this, the physicist simply means that the graph shown above looks as it does, i.e. in particular it shows a nonzero frequency (the plasma frequency) at long wavelength. In the same way, then, the high-energy physicist would say that the wave fields of the weak force “acquire mass” via their interaction with the Higgs field. As we said above, in quantum mechanics the energy inside every wave field comes in discrete packets. For different fields, those have different names. For the electromagnetic field, they are called photons. For the wave fields of the weak force, they are called W and Z bosons. So in particle language, the purpose of the Higgs field was to give mass to the W and Z bosons (and thereby make the corresponding forces short-range). The actual details of how the Higgs mechanism is implemented in the Standard Model were implemented by Abdus Salam in the theory by Glashow and Weinberg. One feature of that theory is that initially photons and W and Z bosons are all parts of the same wave fields, but after the Higgs mechanism kicks in, only the W and Z bosons acquire mass, while the photon remains massless. This is a good thing, because otherwise the Coulomb force would not be long-range, and the world as we know it would not exist. Today the Higgs mechanism is also used to give mass to the quarks and electrons etc. (via the very same Higgs field as introduced for the W and Z bosons). So at least in the Standard Model, there is only one Higgs field. Its high-frequency oscillation, known as the Higgs boson, seems now to have been found at CERN, and its energy is about 125 Giga-Electron-Volt. For elementary particles, this is a lot, although not that much larger than the masses of the W and Z bosons which were the initial motivation behind inventing the Higgs field. On a final note, it should be pointed out that most of our mass is in the protons and neutrons of the atomic nuclei. Now although these are composed of quarks, their mass is mostly due to the binding energy of the quarks and due to the fact that the quarks move around very fast inside the neutrons and protons. Even if the quark masses were zero, the neutron and proton would still have roughly their observed masses (on the order of 1 Giga-Electron-Volt). So although the Higgs field gives mass to the elementary particles, that is only a rather small fraction of the total mass of the planets and stars, because most of that is in the binding energies . This entry was posted in Basic concepts in nature, Physics and tagged electromagnetic waves, Higgs boson, origin of mass, plasma, radio waves, wave physics by Florian. Bookmark the permalink. Thanks for the great explanation! It bridges the gap between all those popular science explanations (based on analogies like moving in a crowd and pictures of the Mexican hat potential that lack the explanation where this this fits in…) and QFT text books. I am an applied physicist and engineer learning about QFT ” for entertainment only”. Despite I had some exposure to the quantum theory of superconductivity I had missed the similarities between the Higgs mechanism and superconductivity. Explanations like yours are exactly what I need to put all the text book stuff into perspective. This post “The Higgs boson, explained simply (the real story)” and resoning inside concerning the Higgs mechanism from the moderm theoretical physics point of view can be considered not otherwise as a kind of joke… Any way, anybody is free of choice the way of explaing the ambient physics reality! Hello: Very nice article. Would you be so kind as to show the graph of the relation between frequency and wavelength with the axis labeled with the corresponding Higg components? What is then the rest mass of the quark if the proton/neutron are primarily mass due to binding energy?